How is Obesity related to Breast Cancer? Insights from 140,000 articles. Obesity is a big problem as more than 70% of American adults are overweight. As we were reading up on the topic we found an article on the website of the American Cancer Society that links obesity to the risk of developing Breast Cancer. The article states, among other things, that women who are overweight tend to have higher insulin levels which could be related to some cancers, including Breast Cancer. This made us curious whether that claim can be reconstructed using the Causaly Knowledge Graph that was created by machine-reading more than 19 Million academic publications in Biomedicine. 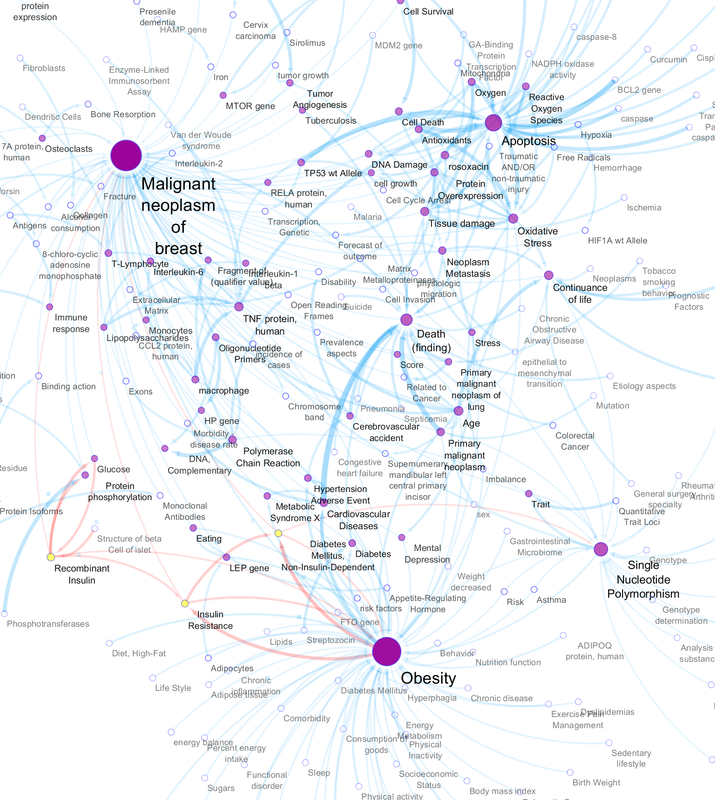 What are the Causes of Causes of Breast Cancer with the most evidence in the Knowledge Graph ? This query returned 300 out of 1,000,000+ relationships. Although this covers only a fraction of all evidence, the resulting diagram reminds us that biological systems are quite complex by nature. There are entities that interact directly with Breast Cancer, i.e. where the distance from (A)->(B) is zero such as (Glucose)->(Breast Cancer). The pathway we are looking for (Obesity)-->(Recombinant Insulin)-->(Breast Cancer) is marked in red. 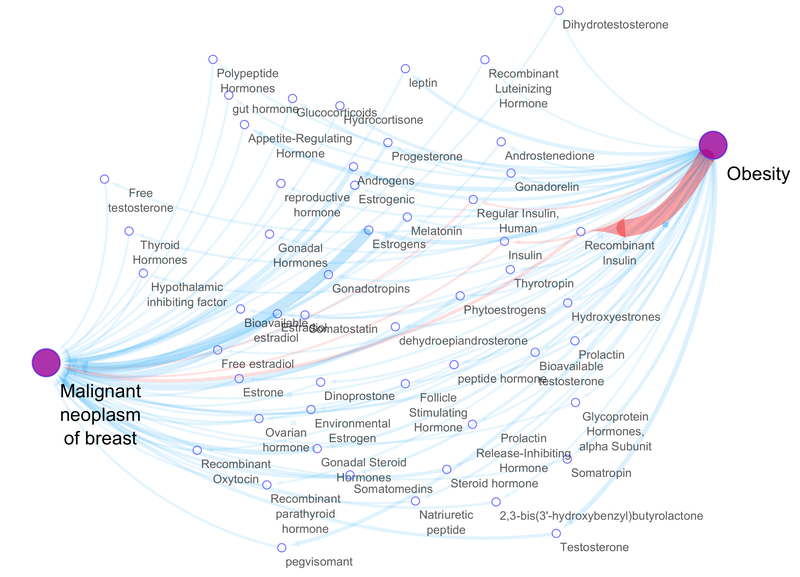 The underlying query machine-reads 143,548 articles within < 2 seconds and returns 53 hormones as potential mediators for the relationship in question. Wider connecting lines indicate that there is more evidence that establishes the relationship between two entities e.g. (Obesity)-->(Recombinant Insulin) is established in 564 academic publications. From the diagram above we can see that Insulin mediates the relationship between Obesity and Breast Cancer as described in the article of the American Cancer Society. Deep Dives: To really understand the nature of the relationship between two entities, we need to selectively deep dive into the evidence from the academic publications. For example, is the underlying evidence based on a Randomized Control Trial or an Observational study ? Is the evidence based on hypothetical statements or definitive statements ? Increase Level of Detail. We asked for (Obesity)->(Insulin)->(Breast Cancer) but we can further increase the resolution of our search query and ask for (Obesity)->(Entity1)->(Insulin)->(Entity2)->(Breast Cancer) to get more detail on the mechanism of action. Our Rapid-Search Platform allows users to go all the way from big picture graphs to the textual evidence of the machine-read publication. We will explore these options in future blog posts. Stay curious :-) !